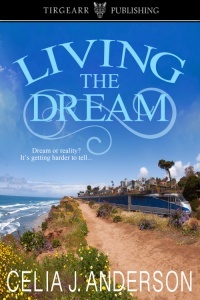 I’m currently organising a blog tour for Celia J Anderson with her contemporary romance/suspense novel, Living the Dream. When dreams and reality crash and mingle, escape can be the hardest challenge of all. Living the Dream will be published by Tirgearr Publishing on the 15th July, and is available for pre-order from Amazon UK, Amazon US, Smashwords and all other good eBook retailers. The tour runs from 13th – 17th July (weekdays only). I’m looking for five blogs which will host guest blogs or interviews. Digital review copies will also be available.